I’m standing in line waiting for a towel, of all things. At our vacation spot, I’m holding my towel card at the Activity Desk, but four other people are ahead of me, and they all seem to be ready to rent chairs, kayaks, and surf boards. I may have a long wait ahead of me. He shakes his head no and points lower. Then he moves his head from side to side while holding his hands over his ears. Whaaa? Oh! I bring my fingers to my ears and remember that I put on my turtle earrings this morning. They’re bright and green and cheery. “Thanks!” I repeat. The clerk ignores everyone else in line, leaves his spot behind the desk, and races up to me. “You just need a towel?” he asks, conspiratorially. The young man smiles at me as if I’m the smartest student he’s ever had. As he hands me a towel, he asks another question. I wonder what the reward is if I get this one right. “What would the world be like if it was filled with only Hawaiian turtles?” he asks, winking. My inquisitor pats me on the shoulder as if I myself have just saved an endangered Hawaiian turtle. And then he hands me a second towel. I beam as if I’ve just won first place. Hawaii’s green sea turtles, Honu (pronounced hoe-new), are named for the color of their body fat, which is green from the algae that they eat. 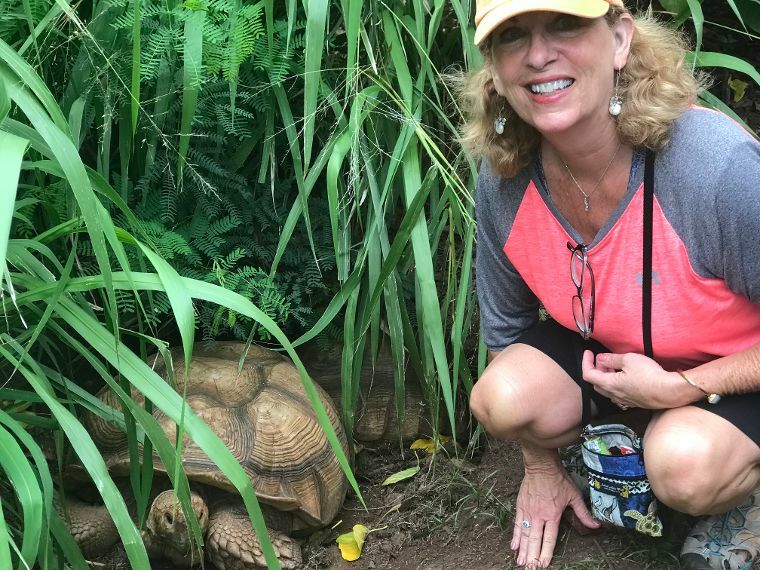 I hiked the cliffs with a few grand people to find the Hanaka’ape Bay Turtle Sanctuary and meet some of these amazing reptiles. Wow awesome post and I too have a tortoise who is different than a turtle as it is not wanting to be in the water but likes to remain on the shore. I so love those turtle earrings. What a beautiful way to connect and get your treasured towels. You are indeed blessed to see these turtles in the wild. There is just something about turtles that makes me smile, regardless of their size. I remember well my encounter with the giant turtles while snorkelling in Hawaii. It was a very special experience. I agree, Joanne. There is something happy and spiritual about turtles. When I talked to the ones in the sanctuary gently, they brought their heads out of their shells and stared at me with eyes blinking wisely. Coolest experience! This sounds like such a wonderful trip. Thank you for sharing. I love the top photo of you standing there gazing out at the world. Honu are such gentle, amazing creatures. Just looking at one is enough to make me smile and be filled with a sense of peace. I’m so glad you’re having a nice time. I think we both should— then we could do a book signing there! What a fun encounter. I so enjoy those unexpected conversations. Such charming earrings and a delightful story. Turns out turtles can live until 80…or more. Those that I saw were between 20-40 years old. They were quite friendly, and when I talked softly to the one (in my photo), he stretched his neck out more as if he didn’t want to miss a word. So wonderful, communicating with creatures big and small. I’d be afraid of losing those beautiful earrings at the beach, but they sure were the ticket to getting your towel (and a special bit of friendly conversation). When I was teaching I liked wearing earrings – funky ones that the kids enjoyed. What a great trip and thanks to your post I know a new word. I enjoy conversations like that when I am waiting in line. Have fun and enjoy! I tend to be introverted and not begin conversations with strangers, Gerlinde, so I’m always appreciative when someone opens up a conversation with me, and my shyness kind of melts away. It was a good thing you wore your turtle earrings! How appropriate. Maybe we need a HONU world! Looks like you had a fabulous holiday. Lovely ear-rings and so apt for the occasion! Your words exude exhilaration just for getting a towel…salute your holiday spirit Pam! Thanks for sharing those beautiful pictures. Did you study up before your trip? You aced it! 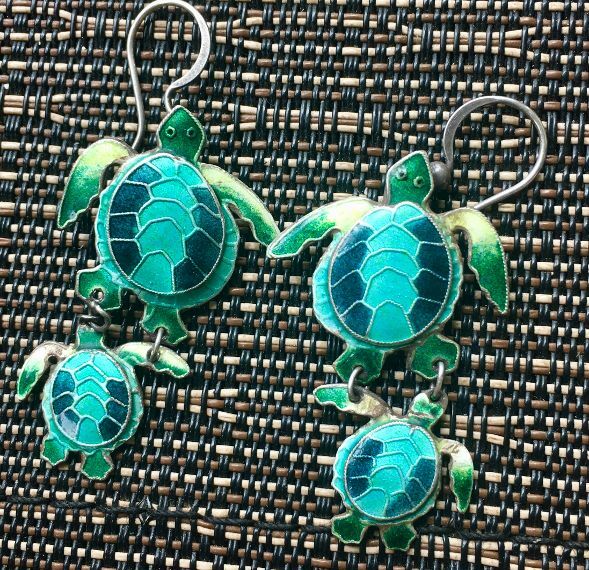 Great photos of the honu and beautiful earrings. Hawaii, huh? I could live there easily. 🙂 Happy vacationing! I didn’t study up. I think the soft warm Hawaiian air sharpened my brain! 🙂 I feel like I could live here too. But I’ve talked a lot to those who do; they love the land and sea and air, but prices on these islands are sky high for housing and food and gas. Many work two to three jobs. I guess being an author doesn’t quite cover it, huh? Haha. We could only wish. Congrats on finding the magic word and plenty of Honu Pam! 🙂 This sounds like a great trip. I loved my one and only trip to Hawaii many years ago. Such beautiful and lush islands. The Hawaiian Islands are definitely a different world than what most of us live in. It’s a nice fantasy for vacation time, for sure. The prolific birds and turtles and whales and flowering plants seem as if they are from a different time and place. 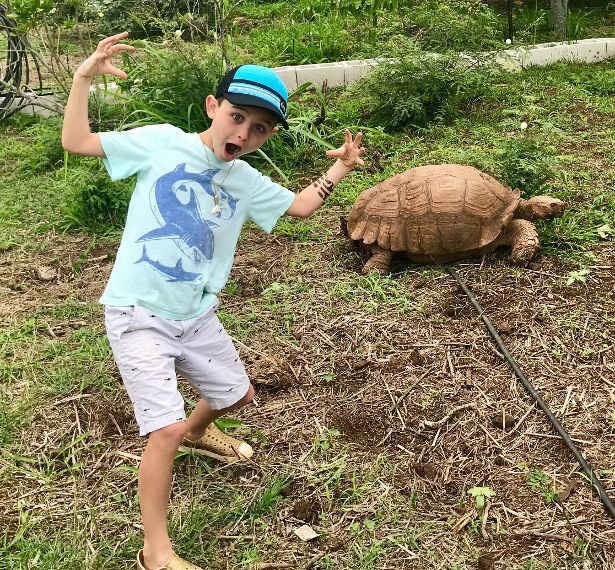 A Honu World – love it! And how nice that you visited the sanctuary. Sea turtles and many other ocean inhabitants are in need of our help. Happy Hawaii! Thank you Pam for this wonderful story. It is so funny how you lit up the day with your new ear rings and then was clever answering two questions right. An event that will live with you. The pictures are wonderful and you look so healthy and pretty. Glad you stayed on your toes–even on vacation! How cool that you were able to see the honu–and to teach us about it. Enjoy the rest of your stay in Hawaii. We have a number sea turtles that visit and they are a part of our island culture. We do everything we can to make sure they are safe. Good post, Pamela. Another wonderful thing about your part of the country, John. I hope to visit it sometime this year (if I’m lucky). A good friend just moved to Austin. I’ll tell her to look out for the turtles (if she travels to the coast of Texas) ! Austin is a beautiful place . My daughter lives there. Yes tell her to look out for turtles. What a fun thing to do. I want to do that now, too. Those turtles are lucky reptiles to have their own sanctuary. These huge creatures seemed so happy in this sanctuary. Volunteers made them huts to sleep in, and the turtles dig themselves spaces to cuddle in. Quite fascinating. What a magical time you must have had it Hawaii. Was there two years ago and want to go back. I didn’t see any green sea turtles. Your grandson looks like he’s having fun! I knew the Hawaiian word for turtle, but I don’t think I would have been quick enough to get the second answer… very clever! Love the earrings! What a cute story! I love your beautiful blue-green earrings. Last June when we visited The Great Swamp in New Jersey, we came upon a large turtle getting ready to lay her eggs. It’s big, slow process. We watched for a long, long time as she slowly dug a hole with her back feet. Sadly, we didn’t have as much patience as she had and left before she was finished. We came back later, and she was still covering the eggs. She was worn out by then. Very clever, Pam. If only saving the turtles was as easy. How exciting to visit the turtles in their (…). I want to say rookery, but I don’t think that’s right. I googled “What do you call a turtle’s home?” and got the answer “shell”. 🙂 I guess turtles are solitary animals and don’t usually live together. I thought it was called a rookery where they all (females) come ashore to lay though, but I could be wrong. We noticed that when the turtles swim in the ocean they seem to be with others. But once on the shore they seem to prefer to be by themselves. A great big smile coming your way…. Love it! Yep, I agree, you win first place – in the line, and in storytelling. What a girl has to do to get a towel these days!!! I love turtles. We saw them nesting at night in Nicaragua with flashlights painted red so as not to disturb them and it was quite a magical sight to see them digging holes to lay their eggs in the soft sand. I’m going to shout now: THOSE EARRINGS ARE ADORABLE!! Where did you find them? Turtles are one of my favorites. I have a bracelet made from the handles of silver spoons and a turtle charm between them. When Hubs and I honeymooned in Mexico, we went on a snorkeling exhibition along Turtle Cove or Turtle Way or something like that, where we got to hang with the turtles. I loved it. What a fun interaction with Towel Man!! 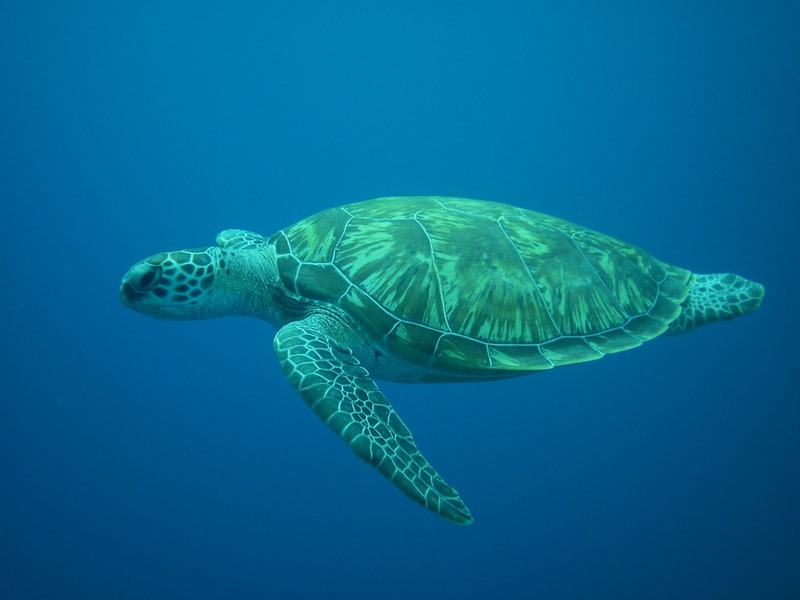 We swam alongside the sea turtles when we were in Hawaii and also the Galapagos – they are such magnificent creatures. I hope they are protected! Thanks Pam. You know you’ll be hearing all about it. 🙂 ❤ Enjoy! Bravo!!! Loved your turtle tale!!! Customer service with genuine interest in you, the customer, and with a smile. If given the choice I’ll always make a beeline for the place I know I’m welcome. Nice story Pam. Tee-hee! What a fun post, Pam. It’s just the thing to get my morning going. Such a delight. I felt like I was there with you. 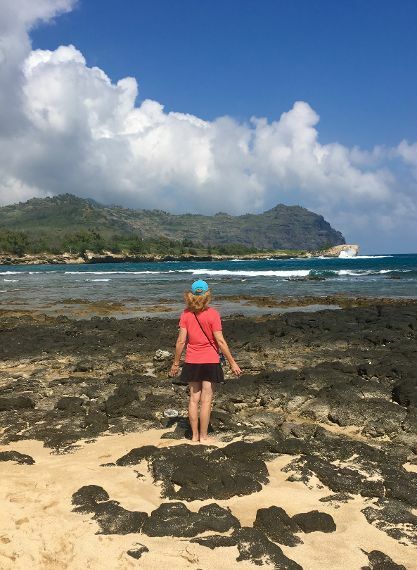 It’s what I still think of as the only *real* vacation I ever had — in the mid 80s I went to Hawaii, alone, the first time I had even been on a plane. I was about 25 I think, maybe younger. A wonderful place and people. Have a wonderful time. Hugs. Love your new earrings Pam. That’s a great story and I remember the turtles of Hawaii. A most beautiful place. It must be especially nice being with your grandkids there. Enjoy the rest of your visit and thanks for sharing a bit of your vacation with us. I so love those turtle studs. What a lovely method to interface and get your prized towels. You are in reality favored to see these turtles in nature. I’m in turtle 🐢 gratitude 🙏! such a beautiful post!!! I LOVE to read and can’t imagine life without this gift.